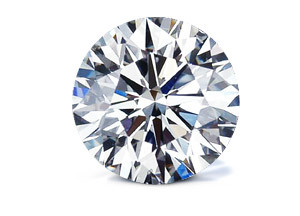 This is a 0.30 carat Round shape, K color, VS2 clarity diamond accompanied by a GIA grading report. Diamonds that are cut with shallow pavilions that do not reflect light back through their crown. The light leaks out from the pavilion, producing a watery spot appearance that is not beautiful. This will cause unsightly reflections in the crown area.